With June just around the corner, the Trade Deadline buzz, speculation, and rumors will be in full-swing sooner rather than later. The Yankees do not have a lot of holes on their roster, but it is a consensus by now that a starting pitcher is the most glaring need. The Yankees have been linked to Hamels in the early going, and now he is showing a desire to pitch in some big games in New York. Hamels told the NY post the following: “The Yankees have a tremendous team. I feel like I have a lot left and I’ve been able to add more pitches and I haven’t had a serious injury. You want to win every single game you go out and play. There’s a lot of games I don’t get to play and you want to be able to see the winning environment [and] that sort of atmosphere. The excitement from everybody, I think that’s the kind of energy that has been created over in the AL East and those guys. In a nutshell, Hamels wants to win and admires the Yankee as a franchise. Hamels is a former WS MVP and saw the Yankees beat his Phillies in the World Series in 2009. 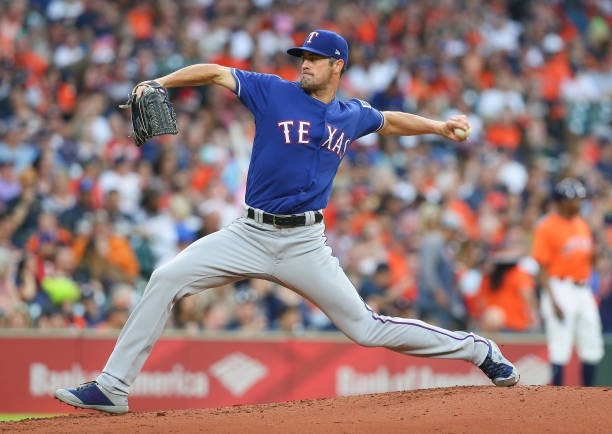 He was acquired by the Rangers back when they were perennial contenders, but with them now occupying the cellar of the AL West, Hamels wants another chance to win and feels that he could be a key cog for a contender like the Yankees. Hamels currently boasts a 3.48 ERA in nine starts in 2018 and will face the Yankees tonight in Arlington.